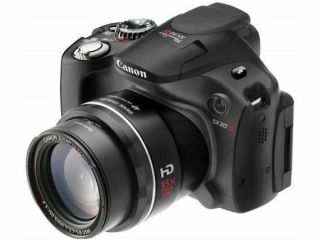 Canon has unveiled its later camera today with superzoom capabilities – the Canon PowerShot SX30 IS. Canon is boasting that the camera comes with full manual control, HD movie recording and "a number of creative and automatic shooting modes". The camera is also equipped with a 2.7-inch vari-angle LCD screen, optical image stabiliser and 720p HD recording. The PowerShot SX30 uses Smart Auto in Movie mode which can detect 21 different scene types and automatically adjusting the settings. But the biggest thing the Canon PowerShot SX30 IS is its monster zoom. Canon has managed to squeeze in a 35x optical zoom lens, which extends from from 24mm to 840mm. Couple this with a 14.1MP CCD and what you have is a rather feature-packed camera which really wants to be a DSLR. The PowerShot SX30 IS has a UK release date of October 2010 and is priced at £449.